Visual marketing is the key to translating messages effectively. Studies show that our brains process visuals 60,000 times faster than text. What does this mean for our clients? Producing infographics is inexpensive, time effective and produces new, visual content that can be used for online, newsletter and pitching purposes. 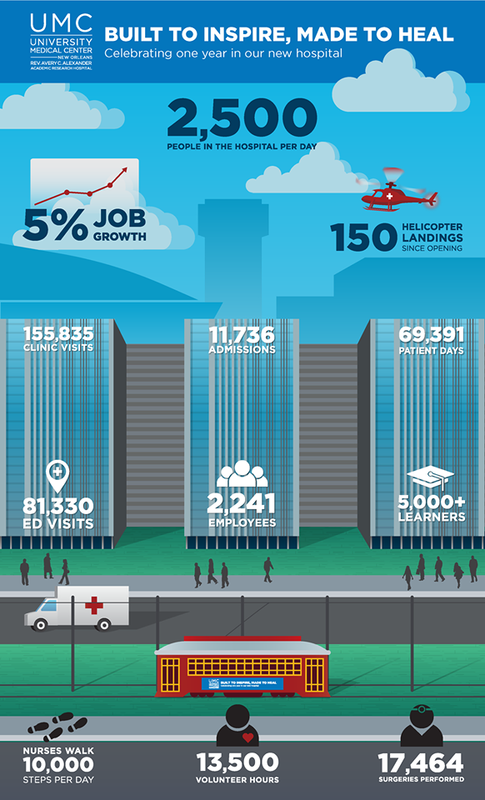 To celebrate the first anniversary of University Medical Center New Orleans (UMC), DEVENEY partnered with the UMC marketing team to develop an at-a-glance visual that would sum up the past year. One of the most important steps in every project is discovery and research, so the team scoured the internet for other hospital anniversary infographics and inspiration. Through this process DEVENEY established a list of interesting facts and figures that appealed to patients, medical students and stakeholders alike. Once the details were gathered, the creative team used a digital sketch pad and real photos of the hospital to recreate the New Orleans cityscape. Pairing each fun fact with a real, corresponding location, the infographic came to life. How do you create infographics for health care clients? Tweet us @DEVENEYMKTG and let us know!